I made another visit to Ray's MTB Indoor Park last Saturday. After riding around the xc loop and the beginner section for only about 20 minutes, I had a run-in with one of the rock gardens. Even though I did and "involutary dismount" from my bike, I didn't hit my head at all, but did take a good hit from one of my pedals to my left knee. 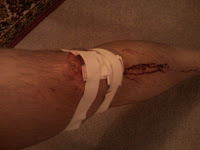 Mind you, this would not have been a problem had I been smart enough to wear my knee/shin guards. So, for the past week, and I'm not sure how much longer, I'm shuffling around in a knee brace and crutches. Ughhh! The first time I rode at Ray's (on my CX bike) I wore guards. I didn't wear them the last time I went out there, but I think I definitely will wear them the next time... I think they still have guards you can rent/borrow while riding. I hope your knee heals quickly! Dude, looks painful. Get well soon!